I’ve written a few times now on my interest in finding good quality beers brewed deliberately to a low strength (3% and lower). When successfully executed such brews (mainly ales; lagers struggle to be palatable below 4% in my view) offer an excellent alternative for drinkers who want to limit their alcohol intake – especially during long pub sessions – and avoid the ignominious need for a Diet Coke or mineral water halfway through. Brews such as Redemption Brewing Co’s Trinity (3%) – which I’ve been fortunate to sample several times and which definitely has my approval when cask conditioned – have now been joined by quite a few others and I’ve been gratified to see that several larger breweries around the country have noticed the opportunity and risen to the challenge, though I’ve failed so far to happen upon them in “real ale” form. However, a number of these bottled varieties are now being sold into the off trade, several of which I picked up on a recent trip to a Tesco superstore, another (guess which?) at an Adnams Cellar & Kitchen shop. The Tesco beers have probably been available for months but I’d never previously noticed them (despite their appealing price tags – as low as £1.00/500ml), hidden away as they were down a different aisle to the main bottled beer selection in the company of alcohol free varieties such as Clausthaler. Not the best place for them if Tesco wants to sell any, to my mind. Given that these were brewery conditioned and likely therefore to be a little over-carbonated – as is typically the case for British bottled beers treated this way – my expectations for the selection were perhaps not that great. However, re-calibrating my brain a little helped make make for an enjoyable experience overall, with only one real dud among them (I’ll let you read on to determine which). Tolly English Ale (2.8%) from Greene King. Deep amber brew with slight caramel nose leading into crystal malt and some toasty and nutty flavours, all balanced by a decent level of earthy hops. This is probably the maltiest of the bunch. Not bad for its kind and clearly related to Greene King-branded big brothers, IPA and Abbot. Marston’s Pale Ale (2.8%) from Marston’s. Hard to like this one. Similarly amber but thin and gutless, lacking enough hop to hide the slight burnt sugariness in the otherwise watery palate. To be honest I didn’t expect much though – while I still enjoy Marston’s cask ales from time to time its bottled versions lose an awful lot in translation and there was less to lose here to begin with. 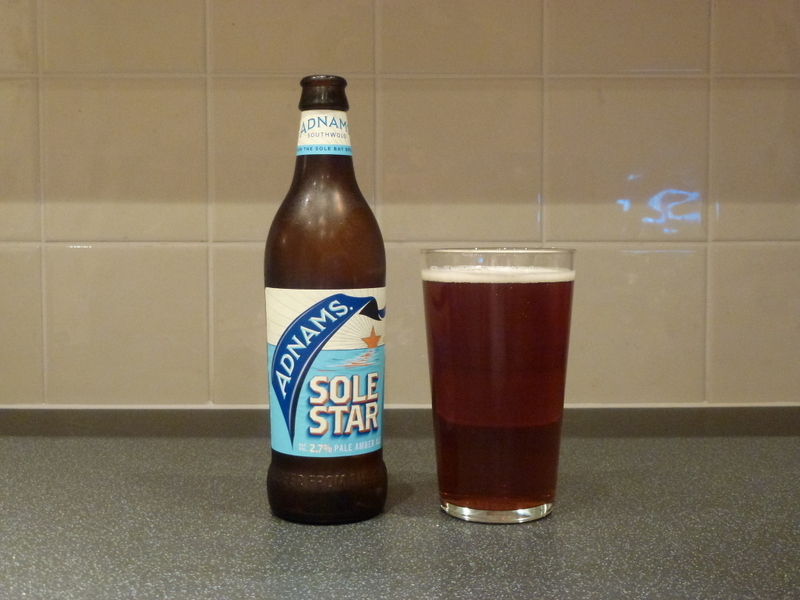 Adnams Sole Star (2.7%) from Adnams. Bottled version of the mini-cask beer I wrote about previously and similarly obtained from one of Adnams London outlets, Sole Star is perhaps the current benchmark of this style in my view. The beer has a rich tawny colour and a surprisingly good balance and mouthfeel for one with so little alcohol. An unexpected citrusy hop note comes through on the finish backing up good toasty flavours. 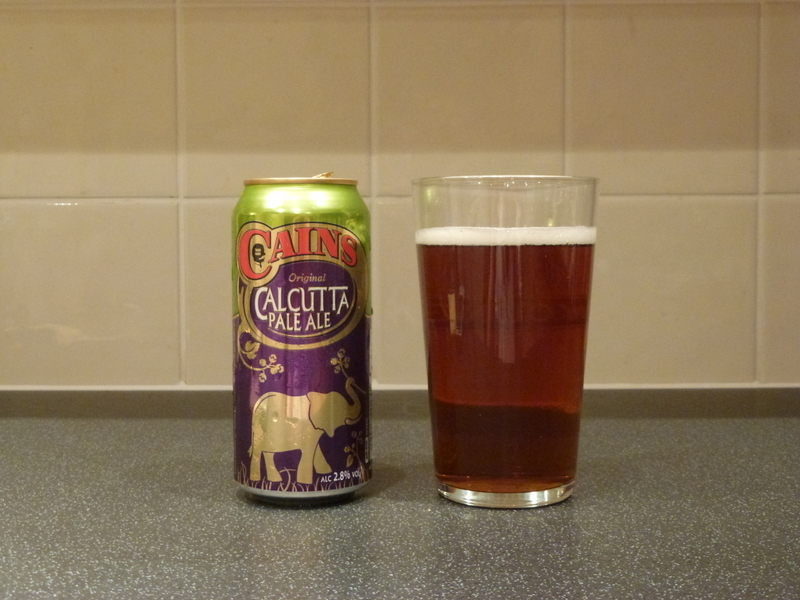 Cains Calcutta Pale Ale (2.8%) from Cains. Made exclusively for Tesco, Calcutta is the only canned beer in this selection (£3.00 for 4x440ml) but doesn’t seem to suffer as a result. Despite a fairly profound caramel aroma and flavour on initial encounter the amber-hued Calcutta develops nicely on the palate and, like the Sole Star, offers a well-integrated whole that belies its strength, albeit this time at the softer, sweeter end of things. 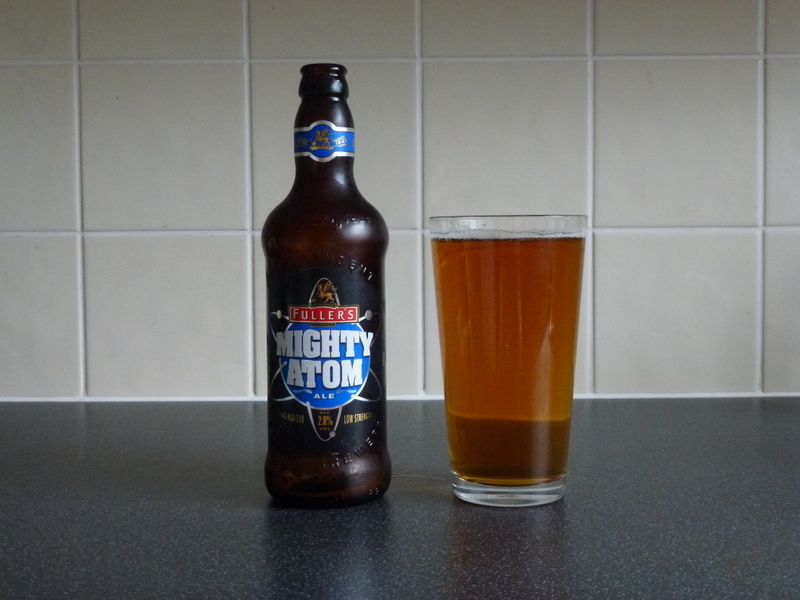 Fuller’s Mighty Atom (2.8%) from Fuller’s. This one’s been on draft around Fuller’s tied estate for a while now but this was my first exposure to it. Crystal malt is again evident in this light amber/deep gold brew, if less so than in the Tolly or Cains. However, it’s hops that dominate, both on the nose and the palate. A blend of five varieties lends the beer both earthy, aromatic and citrusy qualities. Overall, an impressive effort and one I’d like to try “for real” as it were. I do hope brewers continue their experiments with these beers as low-strength alternatives definitely have a place in today’s market and a place in my cellar – I made my way through all four cans of Calcutta in a couple of days. That said, the attributes of lower strength brews are hard to explain to a general public mainly looking for bang for their bucks or to the new breed of aficionados for who stronger is almost necessarily better. My fear is that these brews will not get the attention they deserve and will rapidly be de-listed by major suppliers that prefer to offer better known (mainly cheap lager) brands at absurdly low prices instead. Indeed, Cains’ Caluctta is listed as “not currently available” on Tesco’s website at time of writing. I hope that’s not a portent of things to come.